The Wind Consultancy Service was appointed UK agent for EMD's windPRO software in 2006 and agent for Ireland in 2007. There are over eighty user organisations across the UK and Ireland. The UK agency gives windPRO users in the UK and Ireland a local point of contact and a local perspective on how to get the best out of the software. There will also be locally-specific input to future developments of windPRO. 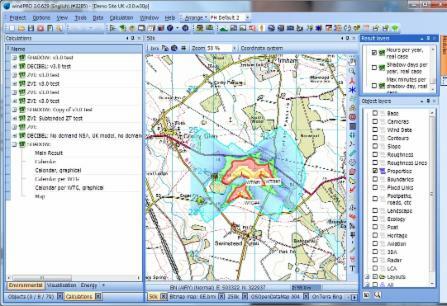 windPRO v3.2 SP3, which was released in late 2018, continues to build on a host of features including new online data services, road construction tool, windProspecing service and time-varying energy calculations. windPRO v3.3 is currently under development. Check on EMD's website (www.emd.dk/windpro) for details of UK- and Ireland-based courses for new and existing users or call to discuss your particular requirements for bespoke training.